Alan Cook, artist, animator and Canadian extraordinaire is leaving JibJab this week, headed to Oregon. His foot print on the site is massive and we will miss him dearly. In his honor, we all took to sketching our own little rendition of Alan in a book we presented to him on Friday. Some of our guys in tech wrote him notes in code, Gregg flat out tried to bribe him with a dollar bill. Alas, he is still on his way. We’ll always have Comic-Con alan. To protect the mushiness of our messages, this is as big as we’ll allow Alan’s tribute art to be displayed. 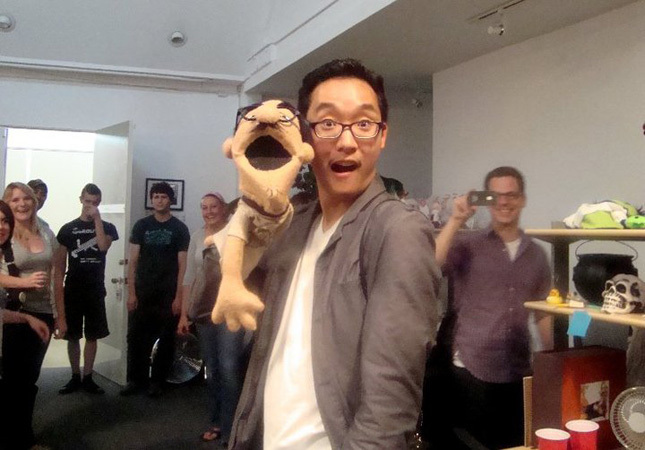 But maybe coolest of all, Mike made Alan this puppet version of himself. We were all stunned by it’s accuracy, right down to the exact JibJab t-shirt Alan would sport around the office. O’Canada…. This entry was written by paulhanges and posted on July 3, 2010 at 8:18 pm and filed under Friends, Inside JibJab. Bookmark the permalink. Follow any comments here with the RSS feed for this post. Trackbacks are closed, but you can post a comment. Wow, you put everyone in there but one.